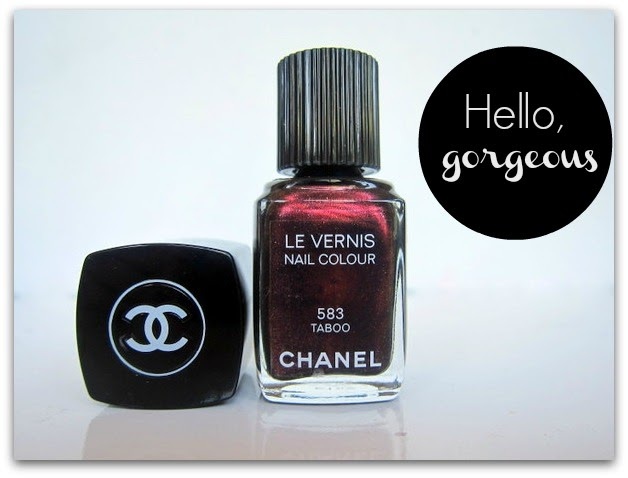 Chanel Taboo Le Vernis Nail Colour Is The Shade of The Season! There's a new addition to Chanel's nail polish cult - if you're a fellow devotee, get ready to fall in love! On counter now, Le Vernis in Taboo is such an attention-grabbingly complex and beautiful shade that you will need it on your fingertips NOW. A mix of warm and cool purple tones, as you peer into the bottle Taboo looks like a mini galaxy all on its own. With swirls of burgundy shimmer in an inky, indigo base, it's shot through with the tiniest flecks of bluish violet, red and pink sparkle. Deep purple might seem like more an autumn/winter type of shade, but it's easy to see why Chanel has released this now. In the summer sunshine, Taboo bursts into glorious, dazzling light - it's complex and hypnotic and gorgeous. The formula is pretty close to perfection - not too thick or too thin, it applies effortlessly and is opaque in one coat (though I still gave it two, to be sure). Add a high shine top coat to really make it sing. Taboo is €22.50 and was designed to compliment the latest lipgloss launch, Collection Révélation de Chanel. What do you think - are you under its spell? Can you believe it Emma, I didn't buy it!!!! Although I like the shade, to me it's just not a summer colour. oooo it's like purple and red and shimmery and everything! Beaut! Its so pretty. so terribly terribly pretty, but I cannot justify the cost! Oh god it's so pretty. Much nicer on your nails than in the bottle. But I don't think I can justify the price. And I think I would more likely wear it in the winter. Dear, I also went to the Arnotts AW13 fashion show, hope we can meet in other event! This is my kind of colour! It makes me excited for Autumn (that combined with this heat wave). The glosses are gorgeous too! Damn you Chanel making so many beautiful things! Ohhh this is such a rich and sumptuous shade, really lovely. Oooh no, it's been ages since I've fallen for a Chanel but the price........I foresee an awful lot of Peridot-like cloning for this one! I smell my new Fall color. Oh wow, this looks nothing special in the bottle but is so, so gorgeous on. In love with the galaxy effect in the light! Really lovely colour, kinda reminds me of OPI's Every Month is Oktoberfest but with more depth.